According to new analysis by IRENA, achieving a 36 per cent share of renewable energy in the global energy mix by 2030 would increase global gross domestic product (GDP) by up to 1.1 per cent, roughly USD 1.3 trillion. 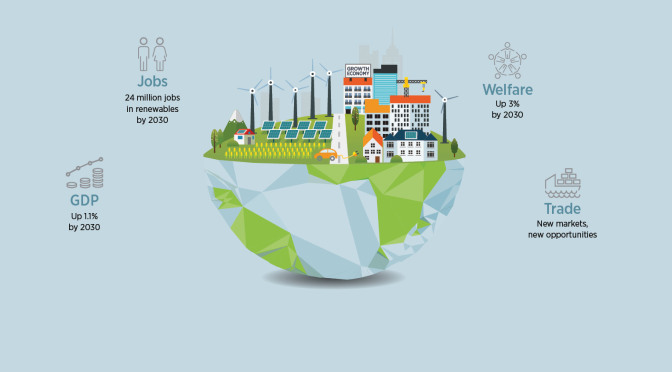 Renewable Energy Benefits: Measuring the Economics, released today at IRENA’s sixth Assembly, finds that dramatically scaling up renewables in the global energy mix by 2030 would increase GDP, social welfare and employment worldwide. Νέα IRENA, RENEWABLE ENERGY. permalink.